Welcome to my little website. I have owned Pomeranians since 1987. 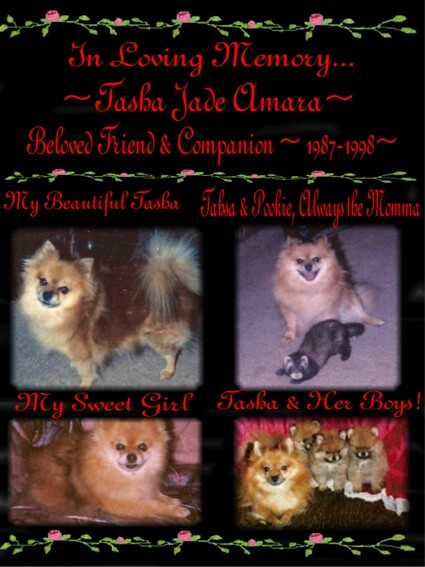 My first Pom was a beautiful little six pound orange sable girl named Tasha. She was a Birthday gift to myself. I had my choice narrowed down to four breeds. 1. Pomeranian, 2. Pekingese, 3. Maltese and 4. Papillion. I just fell in love with the way they tilt their little head side to side when you talk to them as if to say "I understand what your saying." And let's not forget that gorgeous coat! So began my love and deep affection for this wonderful breed. I started breeding the exotics because of their unique colors and beauty. Each and every litter is whelped in my bedroom and raised in our home with our entire family. I am there from their first breath of life until sending them on to their new families, giving them lots of TLC! My family gives these little ones lots of attention as well so when you get your new bundle of joy home, you will have a very well socialized, playful, healthy, lovable little dog! We anxiously await each new litter with great excitement! When we started we looked around for the best foundation we could find. Our little Prince has exceeded our expectations in that area.He is a wonderful example of the breed and is passing that along to his offspring. You can just look at some of our Poms and see for yourself! They are all a blessing from the Lord and we Praise Him for each and every new litter! Our Poms are our family, loved and cherished by the entire family. Be assured that when you purchase a puppy from Sharp Poms, you will have a lovable companion that will give so much in return! Our puppies are trusting little babies that look at everyone as a friend. We only want indoor homes for our Poms so please, if you are just looking for a Pomeranian for breeding purposes and are not looking for a lifetime companion, please do not inquire about our Poms. Please understand that we are responsible for these babies lives, we breed them and go through a screening process if you will to make sure our Poms are going to permanent, loving homes. When one of my babies leaves my home I need to be 100% certain that I have done everything in my power to ensure that they will have a long, healthy life with loving caring owners! These babies are a part of our family and we want to make sure that they are going to have a life filled with happiness and lots of love and attention. A Pom as any other dog, cat or animal needs to be cared for by their owners. They are a life long responsibility and we hope that before contacting us, you are sure that you and your family are ready to give plenty time and care to one of these precious babies. They will be a part of your family for many, many years. They deserve no less!